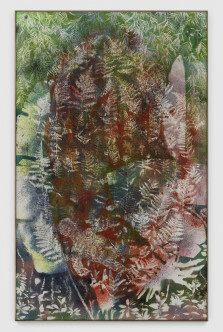 Light Boiled Like Liquid Soap is a series of newly commissioned works by Wilfrid Almendra. 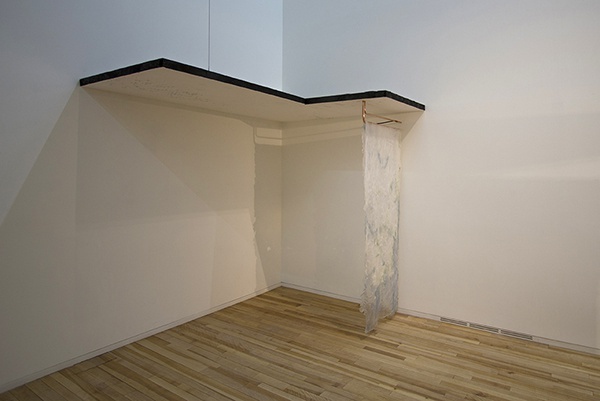 Fogo Island Arts presents the French-Portuguese artist’s first solo exhibition in Canada, an immersive installation featuring sculpture, radio transmission and a series of objects that morph painting and drawing in a play of transparency. 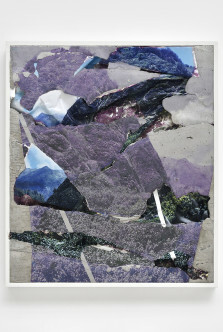 Combining found and repurposed materials, the works on view attest to notions of desire, circulation and flux, from protective spaces of retreat to global economies of exchange. 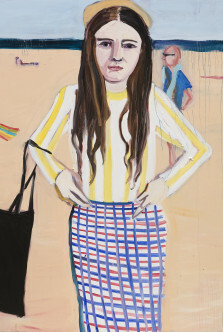 Almendra was an artist-in-residence with Fogo Island Arts in 2015. 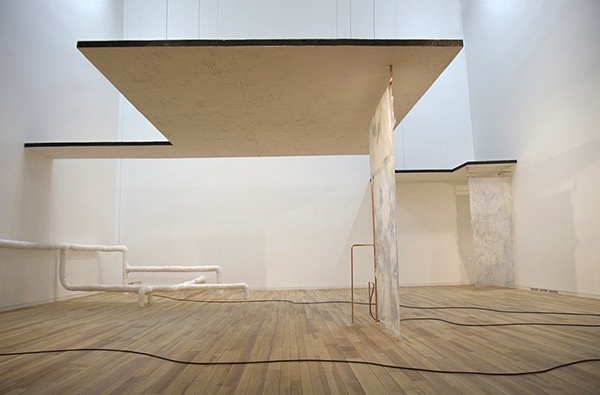 Three floating platforms made of scorched wooden boards and plaster are suspended from the ceiling of the Fogo Island Gallery. 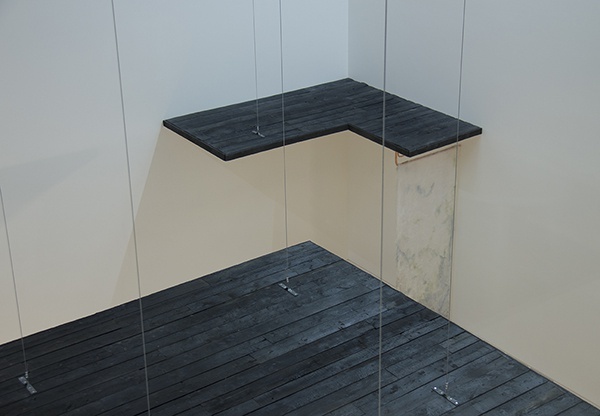 Carbonized black on the upper surface and white underneath, the platforms reference the floor plan of an average house and are hung at standard ceiling height, dividing the vertical space of the gallery in two. 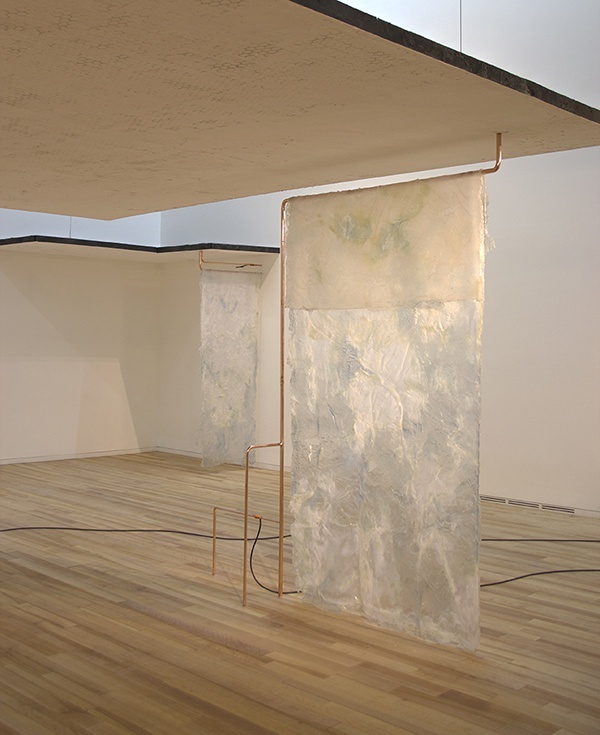 Beneath them and at intervals throughout the gallery are sculptural elements made of copper, plaster and silicone in various states of dematerialization. 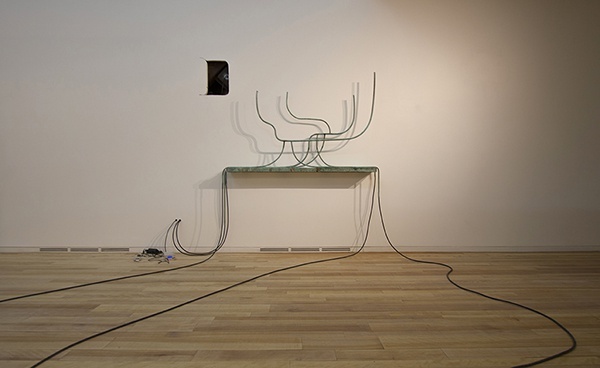 Oxidized copper pipes emerge in and out of the platforms, or are curved into freestanding sculptures. 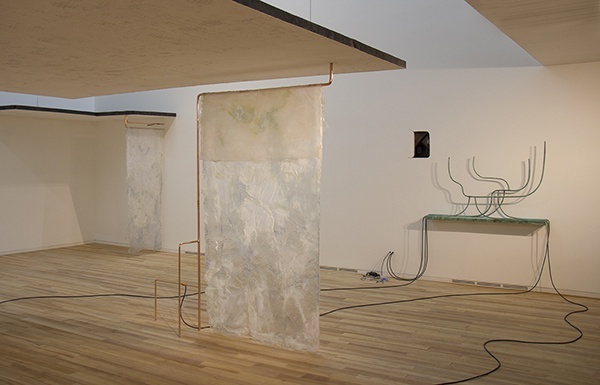 A length of PVC pipe wrapped in plaster bandages runs along one wall, branching into the space and sectioning off an area of the gallery. These formal gestures create spatial relationships that evoke the body and discreetly influence a visitor’s movement through the space. Individually precarious, the works come together as a functioning whole that diffuses radio waves beyond the space of the gallery. Both familiar and destabilizing, the installation takes on the unfinished, transitional qualities of a basement, an environment for experimentation or retreat. Almendra’s use of commonplace building materials references residential or DIY construction as well as surgical alteration and healing. Two large sheets of silicone hang from the platforms. Translucent and glistening, with amorphous areas of colour and a skin-like texture, the sheets are at once attractive and repellent. 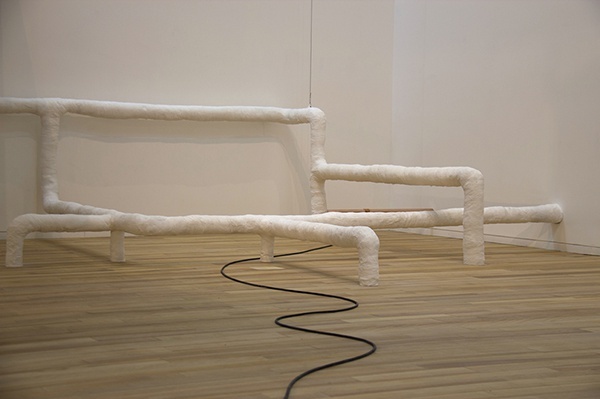 Along with the plaster-wrapped pipe, installed at the height of an exercise barre, the relationship to the body emerges again, and in particular notions of protection and comfort, self-improvement or surgical enhancement. 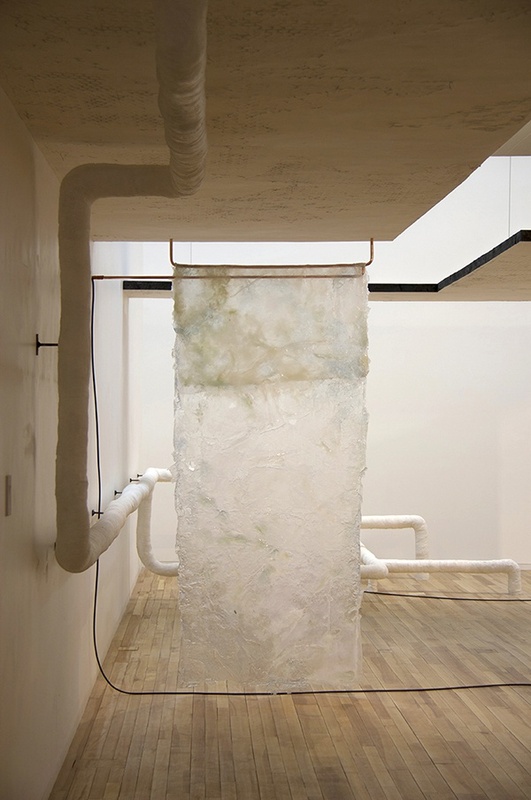 Two plastic mesh potato bags sealed in silicone are displayed on the wall. Made in China, the bags washed up near the shores of Fogo Island where they were inadvertently ‘fished’ by the artist otherwise in search of cod. The mass-produced disposable bags for transporting commodities become rarefied objects inscribed within the language of art and thus another circulation system: the art market. The copper sculptures act as radio transmitters; connected to the steel substructure of the gallery, the entire installation and the building itself become a unified, resonant structure. 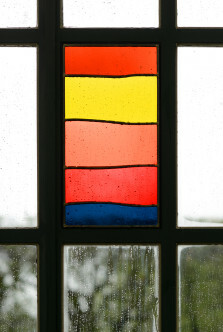 A series of poems recited in Portuguese are broadcast every 15 minutes, pirating the airwaves and conveying their message at a 20 km radius beyond the gallery walls. The author, a Portuguese builder with whom Almendra collaborated on a previous project, narrates the poems. 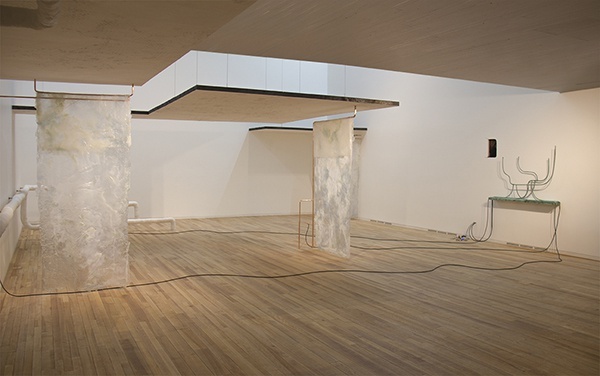 Clandestine and inaudible in the gallery, the poems nevertheless create points of connection with the external world, picked up by passing ships, and evoking historic trading routes between Fogo Island and Portugal. Through its formal and material explorations, Light Boiled Like Liquid Soap addresses ideas of desire and protection, circulation and transmission. 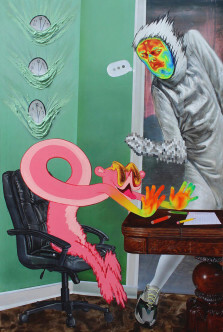 From the transitional space of the basement, with its focus on inward states and external appearances, emerges a desire to connect with the rest of the world, showing the contingency of our relationships across personal and territorial boundaries.